Arizona’s 55+ communities are facing challenges from new generations of retirees looking for neighborhoods more engaged than isolated. Can the industry adapt? Mary and John Cooper, both in their late 70s, are finally downsizing, after living for years in a 7,000-square-foot home in Silverleaf, the luxury home community in North Scottsdale’s McDowell Sonoran Preserve. They’re not retiring; the Coopers passed that phase when they moved to Phoenix 20 years ago, originally settling in Desert Mountain, the private community in the desert northeast of Carefree. But all that peace and quiet quickly grew too sedate for Mary. “That’s in the middle of nowhere, as far as I’m concerned,” she says. Finally the couple heard about Optima Kierland, a $300 million, 12-story, four-tower condo going up just across from Kierland Commons in the Scottsdale Airpark area. They may both be nearing 80, but the active couple has little interest in moving into an age-restricted retirement community. Cooper says the Optima’s location, overlooking both Kierland Commons and the Scottsdale Quarter shopping districts, as well as the Westin Kierland golf course, puts all the amenities of your average 55+ community within easy walking distance, even if none of those restaurants and leisure activities are on the property’s grounds. The Coopers are a prime example of a new type of retirees that experts who study senior issues are seeing: older adults who, instead of relocating to age-restricted master-planned communities, are flocking to high­density urban areas surrounded by plenty of amenities and activities, along with a multi-generational mix of neighbors for human contact. The generation is seeking the same live­work-play environment trending with N1illennials and young professionals. Arizona has a rich history as a retirement destination, largely due to its year-round warm climate and relatively low cost of living. The ironically named Youngtown, developed in 1955 on a 320-acre desert ranch west of Phoenix, is said to be the nation’s first master­planned community specifically £or older adults (the town retained an age restriction until 1999). In 1959, a Mesa developer named Ross Farnsworth opened Dreamland Villa, the first in a line of retirement communities the Farnsworth Development Company would later build under the Sunland Village name. A year later, Del Webb would build Sun City, which solidified the image of the 55+ community for the rest of the world: blankets of glued-down pea gravel front yards that simulated lawns without the maintenance, and quiet streets driven by cardigan-doffed residents in slow-moving golf carts. The Sun City brand, now part of Pulte Homes, expanded to all corners of the Greater Phoenix area: Sun City West was built in the late ’70s, Sun City Grand was added in the late ’90s, followed by Sun City Anthem in 1999 and Sun City Festival in 2006. Other developers launched their own variations on the concept, eventually growing the number of retirement communities in Arizona to nearly 70. 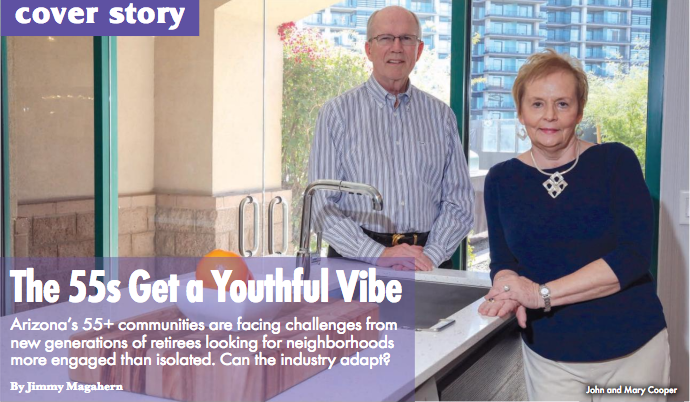 Now it appears tastes are changing, with many retiring Boomers exhibiting a rejection of the isolated master­planned community concept that was, in itself, a “rejection of the outer world,” as LIFE magazine described Sun City in a 1970 article. Are traditional 55+ communities facing obsolescence, confronted by these new preferences among older adults for living environments more plugged into the walkable, energetic surroundings favored by the youth? Another trend threatening the future of master-planned retirement communities is the growing phenomenon of naturally occurring retirement communities (NORC’s, for short) – neighborhoods where residents simply stay put long enough that eventually everyone on the block is in their 70s and older, prompting a need for healthcare-related services that pop up around the neighborhood in the form of CVS MinuteClinics and more specialized walk-in treatment centers. Robson, Pulte, Shea Homes, Statesman Group and DMB, among others – each insist the future of 55+ communities in Arizona continues to look healthy. Some residents of active adult enclaves still enjoy the quieter, more relaxed lifestyle the concept has always promised. Sundin and her husband, a pastor, moved from Washington state about three years ago to start a church in the area, and they enjoy being among like-aged adults who share certain old­fashioned values. Some 55+ communities, like the popular Victory at Verrado age­restricted district within the all-ages community of Verrado near Buckeye, intentionally recreate a kind of Mayberry feel with a small Main Street and home architecture based on early 20th-century design. But many more stick with a luxury resort environment and let the residents themselves create that neighborly vibe through the many social interactions, from pickleball to pottery making, that all 55+ communities foster. Not every older adult needs to move into a multi-generational urban center to experience the energy and dynamism of a more youthful environment. Deb Chiaramonte, a resident of Trilogy at Encanterra, the 55+ district that’s part of the all-ages Encanterra development in San Tan Valley, says she and her husband Bob, both in their 60s, find plenty of what she calls “pulse” in their community. ‘We’re originally from New York, and we moved out to Fountain Hills about 18 years ago,” says the ebullient Italian from Long Island’s south shore. “But Bob and I both wanted to be more active.” When their son and daughter-in-law moved from Chandler to Power Ranch, the Chiaramontes found a nearby adult community in Encanterra. It helps that the properties offer tons of social activities along with fitness centers, walking trails and, lately, more patio bars and gathering places. Encanterra even stages concerts with top-tier musical acts Boomers know from their wilder days. This year the community hosts its seventh annual Good Life Festival headlining Lynyrd Skynyrd in March and Kenny Loggins and Michael McDonald in April. For the residents, the concerts are clearly one more excuse to party.